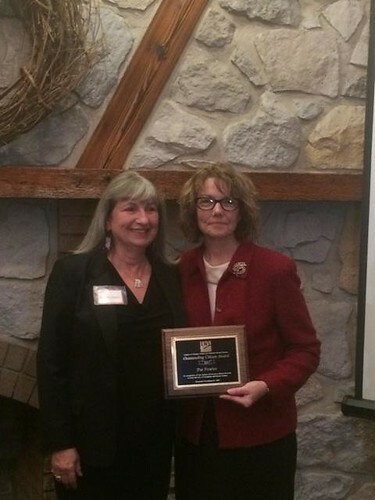 COLUMBIA, Mo 11/26/15 (Beat Byte) -- One of Columbia's most well-regarded community leaders, Pat Fowler has been named 2015 Outstanding Citizen of the Year by the League of Women Voters (LWV) of Columbia-Boone County. Fowler, who received the award Nov. 14 at the LWV Founders’ Luncheon, is known as a persistent, eloquent, and tireless voice for basic fairness and social justice. Through a combination of political savvy and personal charm, she has managed a rare feat, pressing community leaders toward substantive, positive change while avoiding an unfortunate "marginalization-demonization" process that frequently envelops counter-establishment voices. Never a candidate for elected office, Fowler has instead served on many area boards and commissions. As president of the North Central Columbia Neighborhood Association (NCCNA), she brought a genteel toughness to dealings with developers, City Hall, Columbia Public Schools (CPS), and the many social service agencies that call North Central home. When CPS tore down an old house for more parking in her neighborhood, Fowler insisted the district engineer a fix for storm drainage that protected an entire street. She joined neighbors to push back on development plans that changed the face of the historic Hubbell Street neighborhood, demolishing dozens of homes for student apartments whose brick-and-mortar shoulders block out the sun. Parking, storm drainage, poor planning, and overcrowding were among many concerns Fowler cited to city leaders. About the rush toward the alphabet soup of corporate welfare -- EEZ, CID, TDD, TIF -- Fowler penned a widely-shared call for better communication and real community buy-in. "We are...rewarded only by the friendship and respect of our neighbors," she wrotes. "We think this approach models the problem solving and communication skills we want our children and our community to develop and practice." Fowler has used problem-solving and communication skills in many advisory capacities, including as a Columbia Historic Preservation Commissioner; Downtown Columbia Leadership Council member; Boone County Planning and Zoning Commissioner; and Columbia Public Transportation Advisory Commissioner. Braving the wrath of City Hall's establishmentarians, Fowler testified with grace and resolve against the 2012 Blight designation and the one-sided development agreement with the Opus Group, for the downtown student apartment building that drew two successful repeal efforts. Most recently, she co-organized a popular series of "history walks" for the Preservation Commission that tour Columbia's historic buildings, including the Blue Note, the Hall Theatre, and the Tiger Hotel. Tour themes including historic architecture and "scary history," the spooky side of the city's past around Halloween. A non-partisan political group organized in 1920, the League of Women Voters seeks to influence public policy through advocacy and education. It neither supports nor opposes any political candidate nor party. Past LWV Outstanding Citizens of the Year include former State Representative Chris Kelly; Anne Deaton, wife of retired Mizzou Chancellor Brady Deaton; and Ann Covington, the first woman to serve on the Missouri Supreme Court and until recently, a University of Missouri Curator.